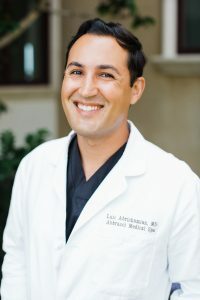 Get to know Luis Abrishamian, one of the medical directors at Abbracci Med Spa. Abbracci Med Spa changed hands in 2014, and is now overseen by the medical direction of Luis Abrishamian, MD and Jorge Vournas, MD. This is exciting news for Abbracci – for both our clientele and the business. For our clientele, because it will allow for a direct dialogue between the medical directors and our clients in terms of treatment and procedure options, and their expertise in helping you make the best choice. For the business, because it will allow us to further extend our services into additional medical procedures and treatments to better serve the community. With that said, we are so happy to introduce Luis Abrishamian, MD! Getting to know all of our wonderful clients, and being a part of keeping them radiant and beautiful. So many! But if I had to pick one it would be lip augmentation with our different fillers. Instant, gorgeous, natural-looking results. What are your top three skincare recommendations? I can’t say enough about some of the creams out there. I highly recommend the IS Clinical Youth Eye Serum, Obagi’s Elastiderm Eye Serum, and Skinceuticals’ Eye Balm for the tired areas under the eyes. The results are astounding if you’re willing to be diligent about using them daily. Sunscreen, sunscreen, sunscreen! Our blog has priceless free skin care tips, some serious nuggets of wisdom in there! Surfing, traveling and spending time with my two favorites, Madeline and Darius. If you weren’t a doctor, what would you do? I’m the luckiest man on earth, I love what I do and I can’t imagine doing anything else. Lobster and lemon sorbet for dessert. A lime rickey on a hot day cannot be beat. Marea or Maldives. One day! Thank you for letting us get to know you a little better, Dr. A!